A formal stream algebra for efficient scalable computer vision pipelines. Try our demo for content based image retrieval. Automatic road and lane boundary detection. There are no negatives in life, only challenges to overcome that will make you stronger. (2007-2011) A Software engineer in HOI/Aste R&D department. I developed a DXF engine for generating Autocad files and a software system for automatic generation of drawings. (2011-now) A PhD Student in the UOIT computer vision group with Dr. Fasial Qureshi and Dr. Ken Pu. My interests lie in computer vision and data stream processing. I worked as TA in UOIT for several courses such as compilers, programming languages, system development and Integration, and software design and analysis. I attended ACCV 2014 in NUS, Singapore and presented the paper 'Accelerating Cost Volume Filtering Using Salient Subvolumes and Robust Occlusion Handling'. This paper presents our Accelerated Cost Volume Filtering (ACF) method, which shows speedup over the traditional Cost Volume Filtering (CF) method. A timeline for my research activities and developed projects. Example of running our traffic pipeline on an input video sequence. The pipeline copies the input stream into different stream processing branches. The top view window is for the output branch and the bottom one is for the edges detected by the edge clustering branch. The chart displays the average latency (in red) and period (in green, throughput = 1/period) for the edge clustering branch. The latency is minimized dynamically at runtime by applying load balancing on the clustering branch. Stop the video before and after 00:17 (load balancing) to see the delay between the two branches (difference between the two frame numbers shown in red). We developed a framework for our formal stream algebra and implemented dynamic reconfiguration to select the best execution plan for a given computer vision pipeline. This is currently accomplished by applying load balancing on a linear pipeline of tasks to minimize the pipeline latency at a predefined value of throughput. We copy an input traffic video stream into two streaming pipeline branches. The first branch contains a SIFT keypoint extraction task to generate a set of SIFT keypoints for each frame. The second branch outputs a list of edges for each frame using an edge detection task. We define for each task, a threshold to control the number of output kepoints and edges. A manual change is performed to each thresold and feedback control will automatically tune the thresold value to maintain a predifined output number of edges/points. Stream processing is currently an active research direction in computer vision. This is due to the existence of many computer vision algorithms that can be expressed as a pipeline of operations, and the increasing demand for online systems that process image and video streams. Recently, a formal stream algebra has been proposed as an abstract framework that mathematically describes computer vision pipelines. The algebra defines a set of concurrent operators that can describe a pipeline of vision tasks, with image and video streams as operands. In this paper, we extend this algebra framework by developing a formal and abstract description of feedback control in computer vision pipelines. Feedback control allows vision pipelines to perform adaptive parameter selection, iterative optimization and performance tuning. We show how our extension can describe feedback control in the vision pipelines of two state-of-the-art techniques. We propose the Accelerated Cost Volume Filtering (ACF) method, which speeds up the traditional Cost Volume Filtering (CF) method. ACf identifies salient subvolumes in the cost volume. Filtering is restricted to these subvolumes, resulting in significant performance gains. We applied our method to disparity estimation from a stereo image pair and developed an occlusion handling method, which acts as a post-processing step that refines the disparity maps computed via filtering. Currently, we are exploring the use of slanted surfaces during the detection of salient subvolumes and we are implementing an efficient version of ACF for optical flow computation. We propose a formal stream algebra as an abstract framework that mathematically describes computer vision pipelines. The algebra defines a set of concurrent operators that can describe a pipeline of vision tasks, with image and video streams as operands. We also extend the algebra framework by developing a formal and abstract description of feedback control in computer vision pipelines. Currently, we are studying feedback control to perform adaptive parameter selection, iterative optimization and performance tuning. We are developing new techniques for generating large-scale mosaics from near ground UAV videos. Such techniques should be able to handle several challenges such as the parallax effects of buildings toward camera motion, the generation of high-quality mosaics and the support of different camera motion models. Road boundary detection using our traffic video analysis pipeline. We are studying automatic techniques for analyzing traffic video under challenging environmental conditions. We addressed the problem of automatic road and lane boundary detection under severe vision scenarios, such as partially occluded roads and unlit highways. Currently, we are addressing the problems of measuring accurate traffic statistics, identify ongoing and incoming lanes, dynamic camera calibration, and adaption of view changes due to wind or human operators. Re-ranking keyword search results using a query image. During my master work, I studied CBIR, where I addressed broad domain image search and retrieval in large image collections by evaluating recent approaches and developing new techniques to provide more precise image description and better retrieval accuracy. "Fast Estimation of Large Displacement Optical Flow Using Dominant Motion Patterns & Sub-Volume PatchMatch Filtering. ", Mohamed A. Helala, Faisal Z. Qureshi, 14th Conference on Computer and Robot Vision (CRV), Edmonton, Alberta, Canada, May 2017 (Best Paper Award). "A Formal Algebra Implementation for Distributed Image and Video Stream Processing. ", Mohamed A. Helala, Ken Q. Pu, Faisal Z. Qureshi, Proc.10th ACM/IEEE International Conference on Distributed Smart Cameras (ICDSC), Paris, France, September 2016. "Constructing Image Mosaics Using Focus Based Depth Analysis. ", Mohamed A. Helala, Faisal Z. Qureshi, IEEE Winter Conference on Applications of Computer Vision (WACV), Lake Placid, NY, USA, March 2016. 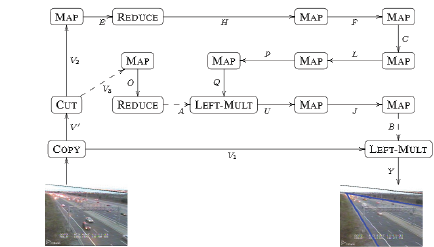 "Automatic Parsing of Lane and Road Boundaries in Challenging Traffic Scenes. ", Mohamed A. Helala, Faisal Z. Qureshi, Ken Q. Pu, SPIE Journal of Electronic Imaging, 2015. "Towards Efficient Feedback Control in Streaming Computer Vision Pipelines. ", Mohamed A. Helala, Ken Q. Pu, Faisal Z. Qureshi, 2nd Workshop on User-Centered Computer Vision (UCCV) in conjunction with ACCV 2014, Singapore, Nov. 2014. 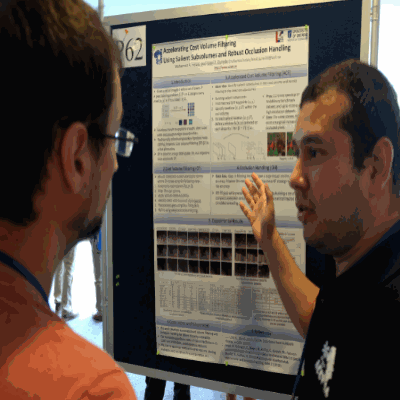 "Accelerating Cost Volume Filtering Using Salient Subvolumes and Robust Occlusion Handling. ", Mohamed A. Helala, Faisal Z. Qureshi, 12th Asian Conference on Computer Vision (ACCV), Singapore, Nov. 2014. "A Stream Algebra For Computer Vision Pipelines. ", Mohamed A. Helala, Ken Q. Pu, Faisal Z. Qureshi, 2nd Workshop on Web-scale Vision and Social Media (VSM) in conjunction with CVPR 2014, Columbus, Ohio, June. 2014. "Mosaic of Near Ground UAV Videos Under Parallax Effects", Mohamed A. Helala, Luis A. Zarrabeitia, Faisal Z. Qureshi, Proc. 6th ACM/IEEE International Conference on Distributed Smart Cameras (ICDSC), Hong Kong, China, Oct. 2012. "Road Boundary Detection in Challenging Scenarios", Mohamed A. Helala, Ken Q. Pu, Faisal Z. Qureshi, Proc. 9th IEEE International Conference on Advanced Video and Signal-Based Surveillance (AVSS) , Beijing, China, Sept. 2012. "Quantitative image search based on feature integration", Mohamed A. Helala Master Thesis, Benha University , Cairo, Egypt, Dec. 2010. "A Content Based Image Retrieval Approach Based On Principal Regions Detection", Mohamed A. Helala, Mazen M. Selim, Hala H. Zayed, International Journal of Computer Science Issues (IJCSI), Vol. 9, Issue 4, No 1, Jul. 2012. "An Image Retrieval Approach Based on Composite Features and Graph Matching", Mohamed A. Helala, Mazen M. Selim, Hala H. Zayed, Proc. IEEE International Conference on Computer and Electrical Engineering (ICCEE), Dubai, Emirate, Dec. 2009. Discussion GroupA weekly seminar where all students in the visual computing lab discuss recent research in computer vision and graphics. ReadingCurrently, I'm reading the book "Decision Forests for Computer Vision and Medical Image Analysis". This book dives into the theory and applications of random forests in computer vision. I like playing with the Sherwood library that accompanies the book.